I’ve struggled with whether to share what happened at DKPS because I felt it might not be in my best interest professionally. But people should know the truth. 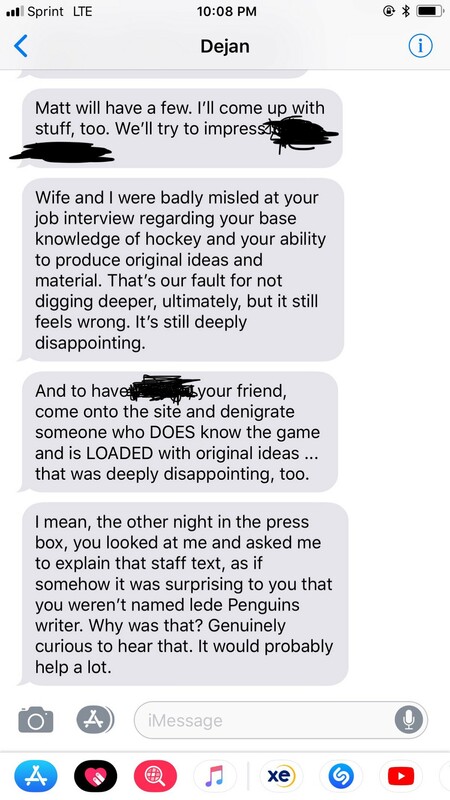 After about a month after I was hired at DKPS, sometime at the end of October, Dejan Kovacevic became convinced that I didn’t “know hockey.” He told me so at a game after he promoted someone else as lead of the Penguins beat and sent out a group text, which I asked him about. 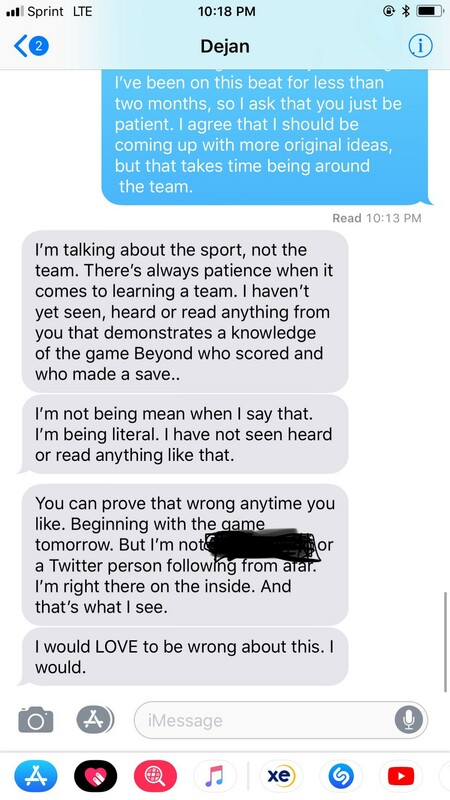 He then proceeded to say I didn’t know hockey and just parroted what others said so I’d fit in with other media members. It was deeply offensive. He even sent texts to other staffers discussing this. He repeatedly sent texts reminding me of it. I had trouble sleeping, wondering what I’d wake up to every day. It never stopped. Not long after, there was a meeting with Dejan, his wife and another staff member. It was bizarre. It felt like an ambush. My work was trashed — work that had been previously praised. Dejan was also upset I talked to people on twitter and had friends on the road. He continued to tell me I didn’t know hockey and that I’d misled him and his wife in my interview. He said I’d tricked everyone I know to this point that I knew the sport. It seemed like he wanted me to say I knew nothing and that I was a liar. To what end, I don’t know. But I wasn’t going to cop to something that wasn’t true. Apparently there was a “cool kids club” on twitter that I just wanted to fit into. It was the most insulting and infuriating thing anyone has ever told me professionally. I was in tears at one point. Dejan said they couldn’t “let” me do video or podcasts. I’d done the podcast twice, video once (after a staff dinner!). He would tell commenters this too. It made me feel terrible. He told them more than he’d tell me about it. In between all of this, Dejan hired another writer he told us would be general assignment, but announced him as joining the Penguins beat. I was told nothing about my current duties would change, but I knew that wasn’t going to be true for long. After that I covered one more game for DKPS and the Penguins’ Thanksgiving practice. Malkin missed a game and wouldn’t be going to Boston the day after. Not a surprise. That day I had to run home right after to get the turkey out and it was a little while before I could sit down to write. Understandable, right? Nope. The following night I received multiple angry texts from Dejan saying he would cover Saturday’s game alone. It escalated to him saying he wanted to take me off salary and pay me per piece. This was around 3am. I called my dad, sobbing, frustrated. I couldn’t afford not to make a salary. I’d just recently bought a car for the 45 minute drive to Pittsburgh for games. The next day, I needed to get Chris Kunitz for a feature I was working on so I decided to go to the game anyway. Dejan finally came over to speak with me. He said I didn’t care about news and thus couldn’t be trusted with daily coverage, which didn’t make any sense considering I’d handled almost every news story since I was hired. He promised I’d make just as much getting paid per piece as I would on salary — basically, it would be my fault if I didn’t work hard enough. I knew this was happening because he wanted to move the new guy in and push me off everything. He was trying to get me to quit. I told him there was nothing left to discuss unless it was about continuing with my current duties. After this, Dejan felt it necessary to write in his column that the whole staff agreed with his decision to fire me. I know definitively that is false. You might ask why I ended up working for him. Everyone warned me. The truth is I really needed a job. I talked to people who’d worked for Dejan and figured he might be difficult but not that bad. I was so wrong. Others who quit or were fired told me they were treated badly but the way I was treated was so much worse. I’ve gone through it all so many times but I still don’t know why. I just know the majority of male staffers were never treated this way. All the red flags were there from the beginning. He told coworkers that he needed to edit all my stories first because he was worried I’d misspell players’ names since I was new. He once told me not to bring my recorder into the locker room and to just get video. There were always comments about my former job at NHL.com, as if it were a bad thing to have learned and worked somewhere else. It was like you had learn everything you knew from him so he could take credit for it. Dejan refused to pay me an extra $4–5k per year, even though they didn’t offer benefits. We were 1099 contractors. Expenses were paid aside from gas and food on the road. It was always “write it off on your taxes” only that’s not how it works. You drove 400 miles round trip? Write it off on your taxes. On one road trip to DC, he waited until two days before to book travel — did i mention he rarely allowed anyone to book their own travel? Gotta get all those Marriott points — the hotel was in Annapolis. Annapolis is not close to DC. At all. He refused to change to something closer that was a little more money per night despite my concerns. Another time, I had to stay with a coworker at her hotel in Manhattan (she was there for a family event) because he refused to pay for a room for one night near Madison Square Garden. What if she hadn’t been there at the same time? And all this from the guy who made a video saying women in sports have it easier than men because players think they’re attractive so they’ll get better material. There’s more. So much more. Ask anyone who’s ever worked for him. I’m not sure what any of this is supposed to accomplish, but I can’t stand the weight of keeping it in anymore.